I cut a strip 3.5" wide. How I determine the length is to measure the top edge of the quilt. In this case it was 51". I want the sleeve to be 2" inside each edge of the quilt, so I subtract 4" off the 51"= 47". 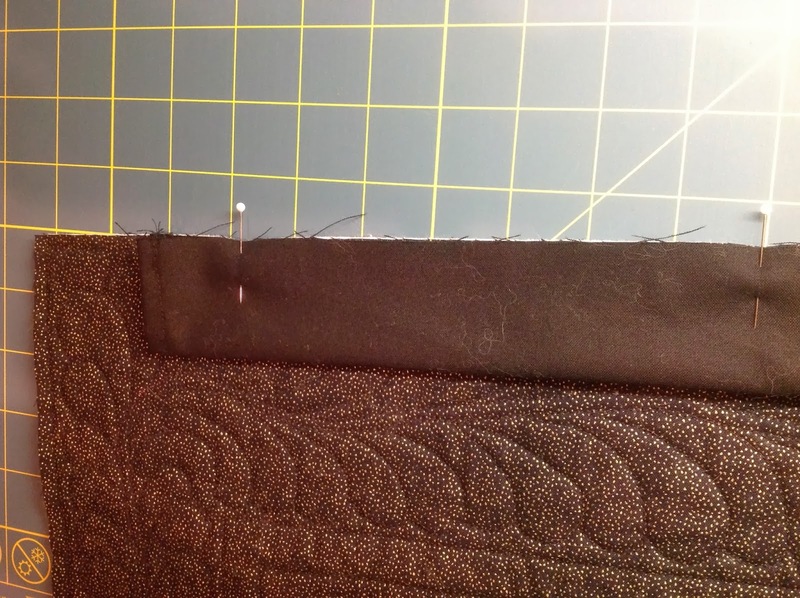 Then, because I will be finished each edge of the sleeve, I allow a 1/2" per edge, (turn under 1/4" twice on each edge) so I add 1" back on to the 47, which equals 48". 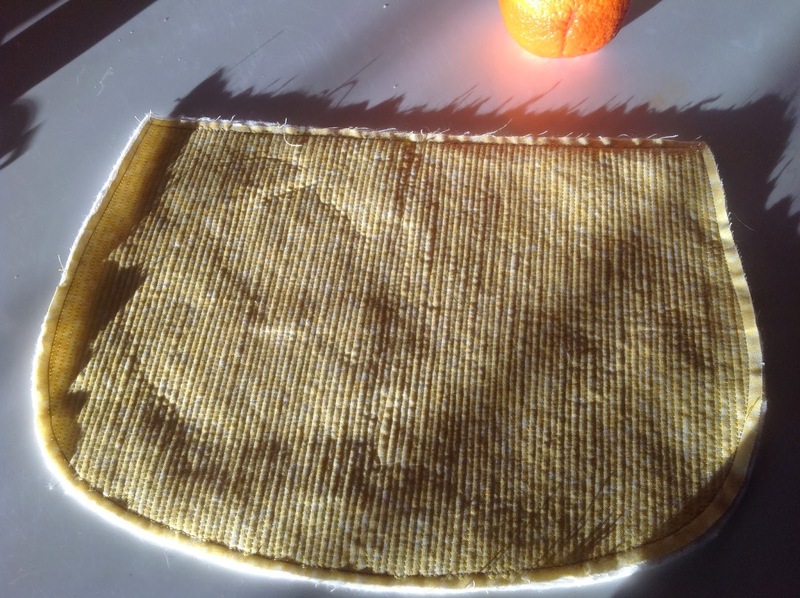 Join however many strips you need to equal your determined length with a mitred seam. Once I have finished the short edges of the sleeve, I find the centre, and mark it with both chalk and a pin. You can see the centre here, the finished short edges, as well as a mitred seam. Fold the sleeve in half lengthwise wrong sides together, and press lightly; you want a tube to slip a dowel inside for hanging, right? Find the centre of your quilt, match it to the centre of the sleeve, and then pin the entire sleeve to the raw top edge of the quilt. Stitch through all layers with a walking foot. 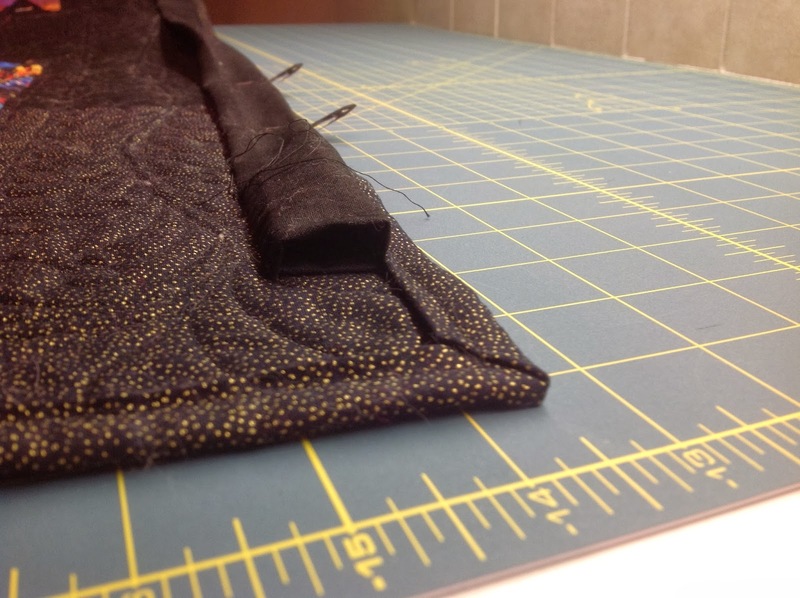 Use a scant 1/4" seam. Apply your binding to the quilt as usual. 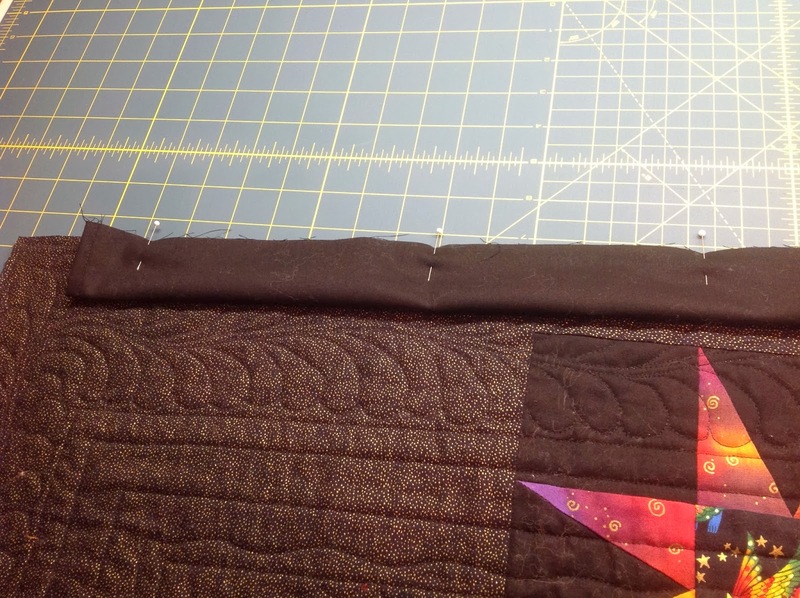 I like to use a double-fold binding, apply it to the front of the quilt sandwich, and then hand-stitch it down on the back. 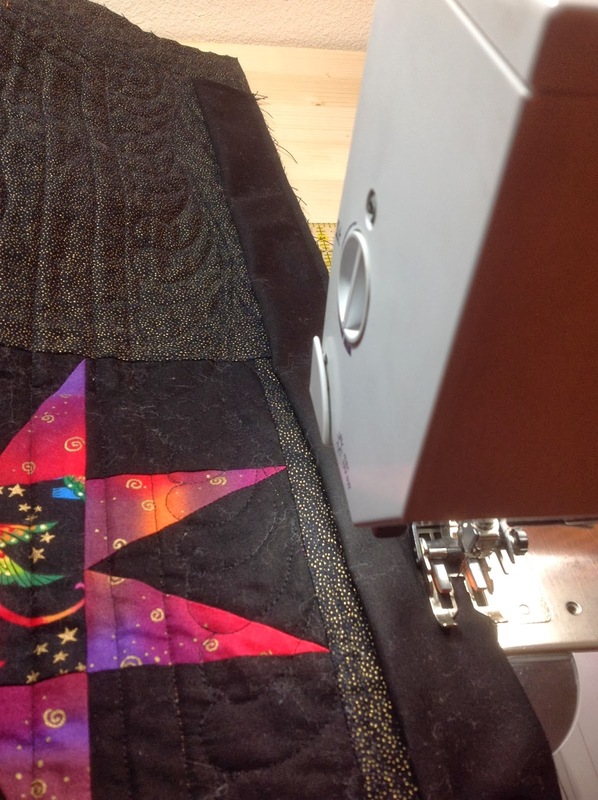 Rarely, I will machine stitch from the front side of the quilt, in the ditch, catching the folded over edge of the binding as I go. Whatever method you use, finish off the binding as usual. You will have a "floppy" sleeve at this point. Were you to put a dowel in the sleeve at this point, the sleeve would show above the quilt. Gasp! 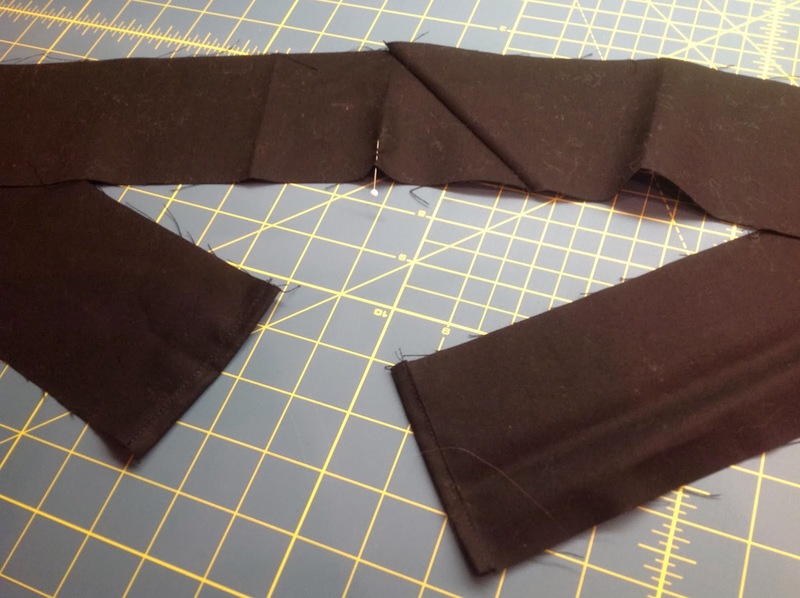 We can't have that, so you need to sew down the lower edge of the sleeve to keep it in place. Here is a trick I learned from Judy Villett in that Colourwash Quilt class I took all those years ago. 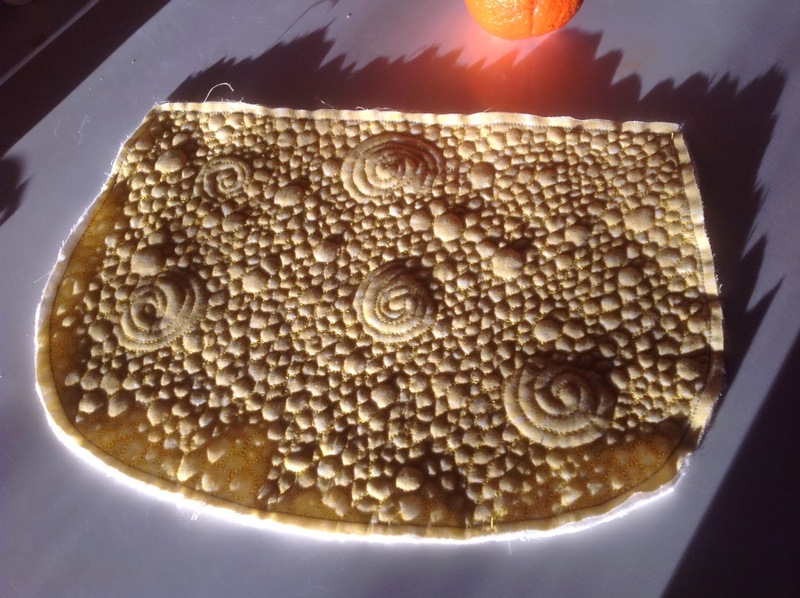 You do not want to sew the sleeve down taut or flat to the quilt; you need to allow some give, or breathing room for the width that the doweling will take up. 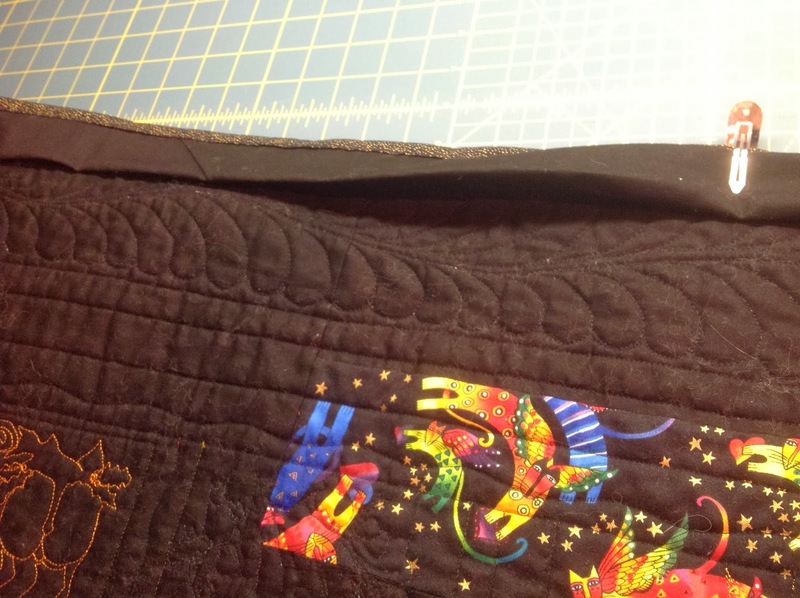 To do that, push the top edge, the edge just under the stitched down binding, to the top edge of the quilt. This brings the lower edge of the sleeve up about a 1/4" or so. 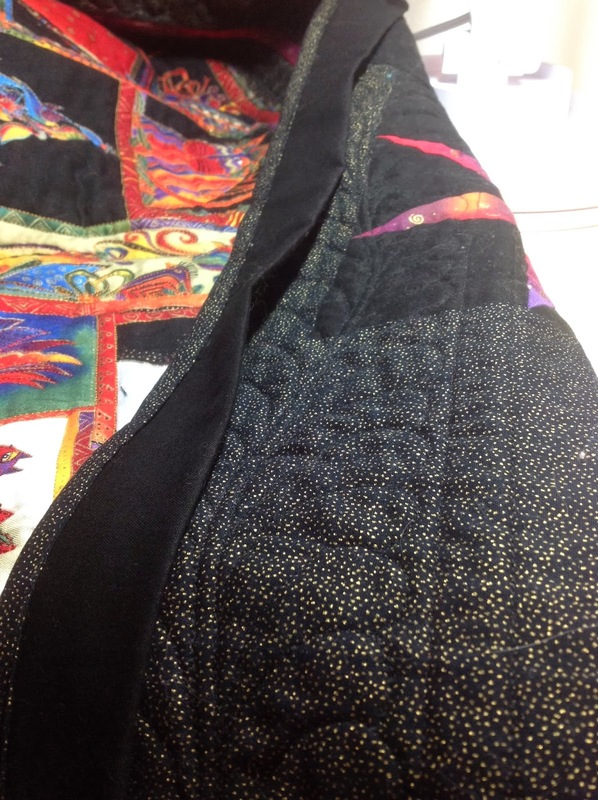 The lower pressed edge of the sleeve changes slightly once you've pushed or rolled the top edge of the sleeve up even with the top edge of the quilt. After I've hand-stitched the lower edge, see how the sleeve poofs up a bit? Cool! Another view so you can see the room that has been created for a dowel. Buy a piece of dowel that is 2" longer than your finished sleeve. 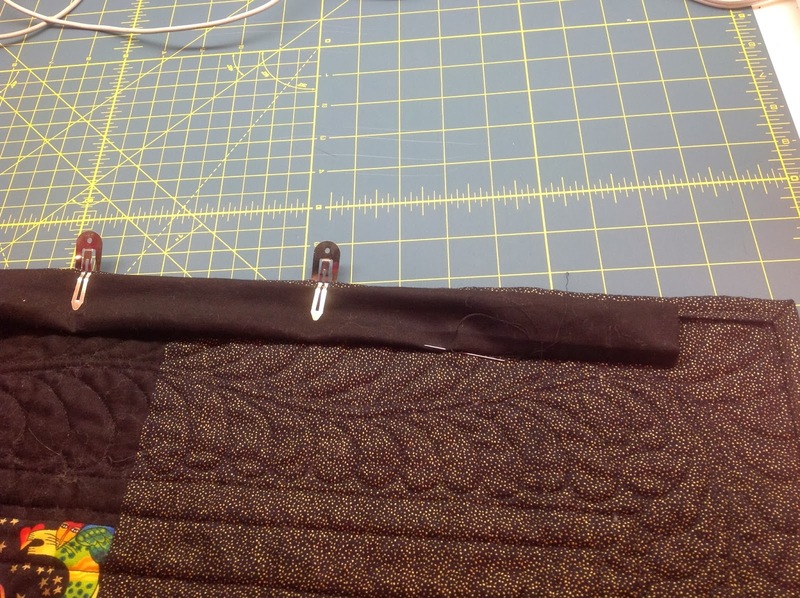 This is so that the 1" sticking out on either side of the sleeve will rest on the nails in the wall, so there will be no pull on any part of the quilt! 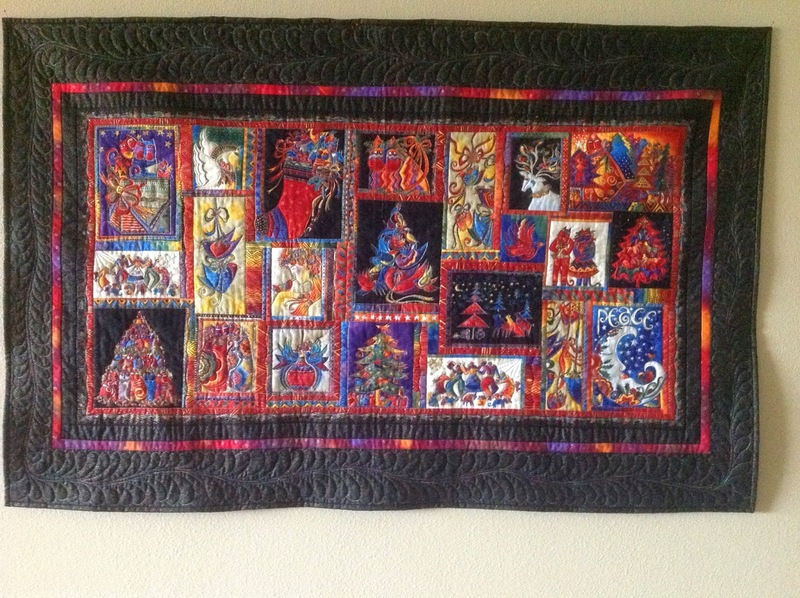 I am very pleased that the quilt hangs as nicely as it does, considering how much out-of-square the printed panel is. Okay! On to the next of the 26 projects! Gosh I love love LOVE sunshine! For so many reasons! You would never know that it was not square! It looks absolutely stunning! And is that a Florida orange I see glowing in the last two pictures?? Oh how I love the sunshine as well and oh my goodness what the heck is that? Looks like it took months to get that far! The matchstick quilting in the first pic has 106 lines I believe across 14". It took about 45 minutes. The pebbled one with a few swirls took about an hour and a half, maybe a little more. I had to stop and rest my neck and eyes a couple of times! Would you believe these are for a bag? And probably won't be seen except by me, as they will be inside?! I just had some fun and played a little. Oh, yes that is a Florida orange, bought from the farmer who grew it. :-) Isn't it crazy how the sun makes it glow? It's a Wrap - Another Project Done! Charm Square Quilt - top finished!